Front row: James Day, Aaron Lind, Natalie Hutcheson, Jill Willis, Zack Cash, James Neil, Scott Gudmondson, Megan Prkut, Veronica McGuire, Rebecca Hill, Lisa DiThomas, Farrah Feist, Tanya Cole. Middle row: Heather MacPhee, Garth Lind, Rusty Miller, Craig Yeagley, Kirk Palmberg, Rob Rising, Loren Myers, Chris Courtney, Tony Hoiby, Jeff Portalski, Jack Olivers, Mike Zahn. Back row: Charlie Smith (assistant coach), Eric Tollefson, Donovan Russell, B.J. 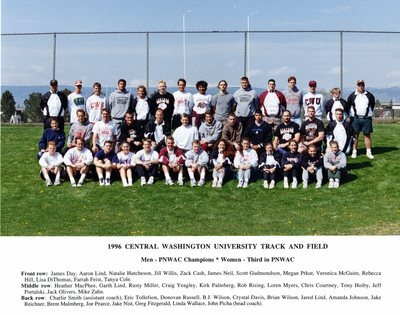 Wilson, Crystal Davis, Brian Wilson, Jared Lind, Amanda Johnson, Jake Reichner, Brent Malmberg, Joe Pearce, Jake Nist, Greg Fitzgerald, Linda Wallace, John Picha (head coach).